Update (02 Oct 2016): This could be the last update for the year. A few minor adjustments were made to the stamp release dates. Another change for the Christmas (15th. c. Florentine) from 11 to 18 Oct, but the city of release remained unchanged (Washington DC). The Hanukkah stamp will now be released on 01 Nov in Boca Raton, FL and the Christmas (Nativity) stamp on 03 Nov in Washington, DC. At this point, it is believed the entire stamp program is known for the year. See the release dates for all the stamp below. Surprisingly, little to no postal stationery was released over the entire year. Signs of times to come? The other blog post with details on the stamp printing and designers will be updated soon. Update (05 Sep 2016): Another stamp issue has been added for release this year. It's a greeting card-rate stamp in the butterfly series (sixth in the series). A 68c stamp non-machinable rate stamp on Eastern Tailed-Blue butterfly will be released in 2016. Although a special rate stamp, it will remain valid 'forever' for it's intended use. No release date or place of issue has been announced yet. Update (28 Aug 2016): CSAC and United States Postal Service have heard all your voice. A new postage stamp will be issued on 05 October to celebrate Diwali, a Hindu festival. Petitions for this stamp subject have been made for over 10 years and a decision was eagerly awaited by the Indian American community. It's a highlight for this blog because of it's focus on India Post and USPS, and because Diwali brings both the countries and it's culture together. The stamp featuring a traditional lamp called 'diya' was designed by Greg Breeding using a photograph by Sally Anderson-Bruce. William Gicker was the art director for this project. The stamp will be released at the Indian Consulate in New York. Diwali will be celebrated on 29-30 October this year. In other news, dates for a few stamp issues have been adjusted and release locations updated as well. These updates and the high level stamp program is below. Happy Diwali and Happy Collecting! 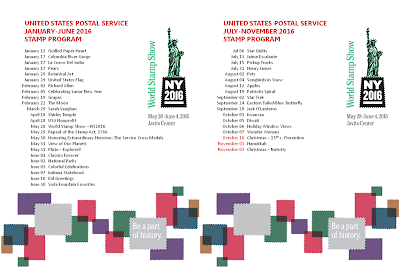 Update (06 Aug 2016): This post had not been updated in the last few months, mainly because USPS did a good job disseminating information to philatelists and there were other posts on this blog that contained new on recent stamp issues, especially the ones released during the World Stamp Show in New York. At this point, dates for all known stamps for 2016 have been announced. The last one to be announced was for the 1 cent Apples definitive stamp (12 Aug 2016 release date). Following stamp issues were added beyond the ones made known earlier. The updated stamp program is posted below as well. As mentioned earlier, the detailed version of the stamp program will be posted in another blog. Here's the stamp issue program, in an easy to read set of two images (03 Apr 2016). Moving the detailed schedule to a new post (04 Mar 2016). Update (27 Feb 2016): Added dates for Indiana Statehood, Holiday stamps (4 issues), Jaime Escalante and Soda Fountain Favorites (to be release in Nashville, TN). Update (13 Feb 2016): Just separating out Q1 2016 from the remaining months. This should help keep a track of the issues until March and then add on as more first day of issue dates are available. Happy Collecting! Update (30 Dec 2015 & 23 Jan 2016): USPS appears to have provided a major update to the stamp issues for 2016 a couple days ago over a call with stamp news editors. 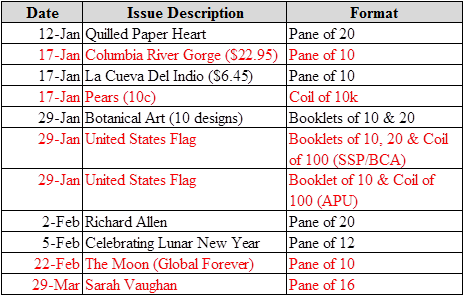 This information actually enables to move to the tabular format for stamp releases in 2016. Information for print quantity, printer, designers and city of release will be added later. Among the new subjects introduced in this recent update, quite a few (highlighted in red below) were mentioned in the Washington Post's leaked CSAC stamp list. The Grapes and Pears stamps are considered as the '5 & 10 cent low denomination designs'; Views of Our Planets could be the 'Solar System' from the CSAC list. The new year will soon be here. USPS has already announced several stamp issues. This list includes some stamp subjects from the Washington Post leaked stamp list. Adding stamp release dates below as they are announced or confirmed. I'm glad I found this web site.I just found this blog and have high hopes for it to continue. Keep up the great work and Happy Diwali to you all.